One of the most important and biggest bank of Dubai, Emirates NBD, has unveiled a blockchain project known as Cheque Chain. The main purpose of the financial institution is to cut off Cheque-Related fraud. Dubai has been working with blockchain technology in many different fields. Moreover, it has promoted the use of blockchain in several occasions. Now, Emirates NBD, the biggest bank in the country, will implement blockchain product that will strengthen the security standards in the banking sector in the UAE. The program tries to reduce the fraud related to Cheque-handled transactions. With a QR code, will register each of the cheques on the blockchain platform that the bank runs. In this way, the bank would be able to validate and authenticate the cheques. Furthermore, the bank will have an increased control over the transactions performed. According to the information released by the bank, it has registered over one million leafs using blockchain technology. At the same time, the bank may open in the future a blockchain platform that would be used by other banks and UAE financial institutions to improve their services and products. Dubai has a very active blockchain sector with several enterprises located there and investing in the UAE. 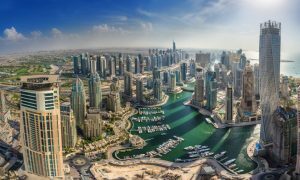 The city of Dubai has issued licenses for cryptocurrency trading firms that want to settle in the city. The Dubai Multi Commodities Centre (DMCC) is attracting different crypto investments to the free economic zone in Dubai. For that reason, it has started issuing licenses that allow firms related to cryptocurrencies and blockchain operate in this free economic zone. Finally, Dubai was also hosting the first Blockchain developer training program with ConsenSys Academy. The course was taken online by 1300 applicants form 96 different countries. In this way, the gap between the technological demand and the offer will be shortened.